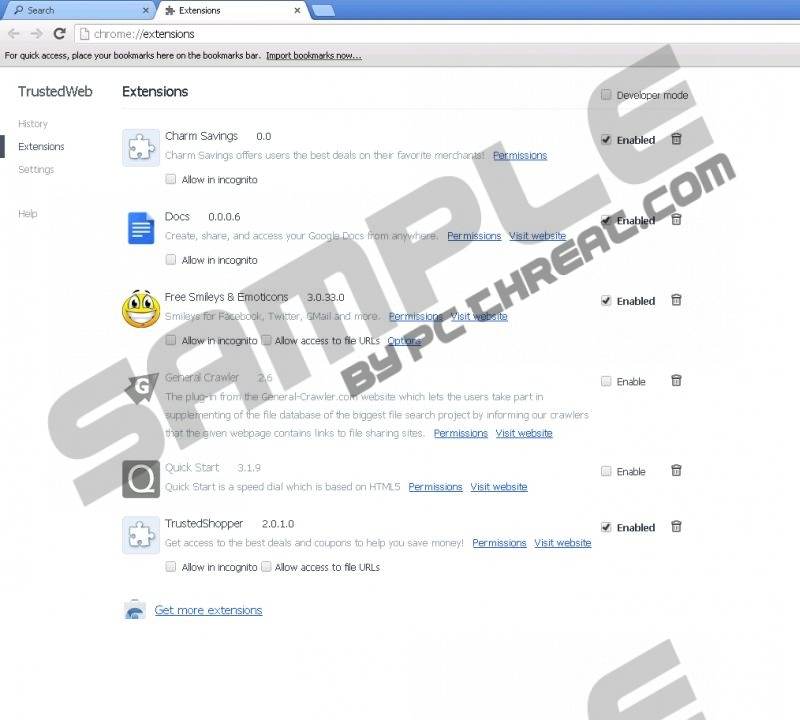 TrustedShopper is an adware program, and, if you want to browse safely, you should remove TrustedShopper once it is installed onto your PC. The application is spread by several programs. For example, it is known to be distributed by SpeedUpMyComputer. Moreover, the application is distributed by the installed promoting the Internet browser TrustedWeb. The browser is available at three identical websites: trustedshopper.net/, trustedweb.org/ and veribrowse.com/. The Internet browser is bases on the engine used by Google Chrome. 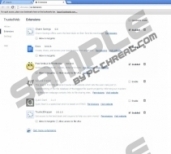 It has been found that the browse also promotes the Conduit search engine. When you launch TrustedWeb, it loads search.conduit.com, which also provides you with third party advertisements. TrustedWeb has been found to contain Charm Savings, Free Smileys & Emoticons, General Crawler, Quick Start and TrustedShopper. As you can see, this Internet browser promotes not only TrustedShopper, but also some other undesirable programs. We recommend that you remove Trusted Shopper from the computer because the application can read your information on the browsers. It can record your bookmarks, browsing history and other actions on the Internet. It means it may record your search terms, clicks and other non-personally identifiable information, which could be used for marketing and advertising purposes. TrustedShopper advertisements may vary greatly. You may find web banners, coupons and advertisements. As to the coupons, they are likely to be related to third party websites. For example, when browsing amazon.com, you may find coupons that take you to buydig.com, hhregg.com, and other third party websites. TrustedShopper is not affiliated with those third party websites and is not responsible for the accuracy of the offers and the quality of the products. The application only generates advertisements, which means that you may be provided with links to unreliable websites. Bear in mind that you are the only person responsible for your actions on the Internet. In order to prevent data loss and damage to the system, you should remove TrustedShopper from the computer. Below you will find our step-by-step instructions on how to uninstall the application and remove it from Mozilla Firefox and Google Chrome. The removal guide will also help you uninstall the unwanted Internet browser. Nevertheless, we recommend that you rely on a powerful spyware removal tool. Install SpyHunter if you want to have TrustedShopper removed and the system protected. SpyHunter can shield you from malware and spyware programs, so do not hesitate to implement it if you want to browse the Internet safely. Uninstall Trusted Shopper, UpdataChecker and other unwanted programs. Remove the unwanted browser plug-in. Quick & tested solution for TrustedShopper removal.